Our first full day in the US and we spent most of it in Walmart. As Walmart's go, it was a pretty good one but it was a Walmart nevertheless. D was like a kid in a candy store. He loves big shops. We're here for six weeks, with plans to do lots of cycling. Never one to think inside the box D decided that renting bikes everywhere we want to cycle was going to be far too expensive, so why not buy them instead. 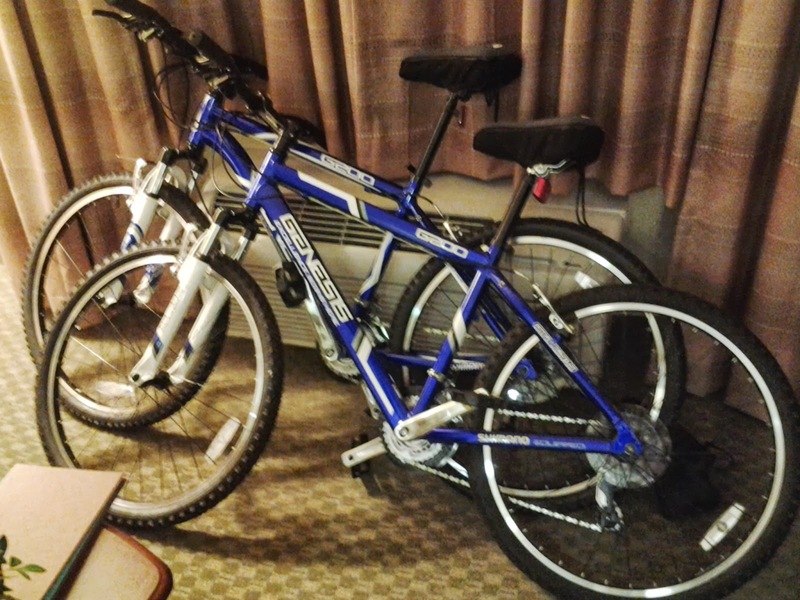 We spent the better part of the afternoon riding up and down the aisles of a Walmart in suburban Denver trying to choose between the cheapest and the second cheapest bikes - and we are now the proud owners of two brand new, not the absolute cheapest they had, variety store bikes. We took them for a short spin on the path next to the US470 when we finally got out of the shop, and I have to admit they're not half bad. Mine won't change into the lowest gear at the front, but for $200 bikes what can you expect I suppose. It didn't occur to me to check the gears worked when I was doing all that cycling in the shop. I'm going to put that one down to jet-lag rather than admit to being an idiot, but you can make up your own minds on that one.